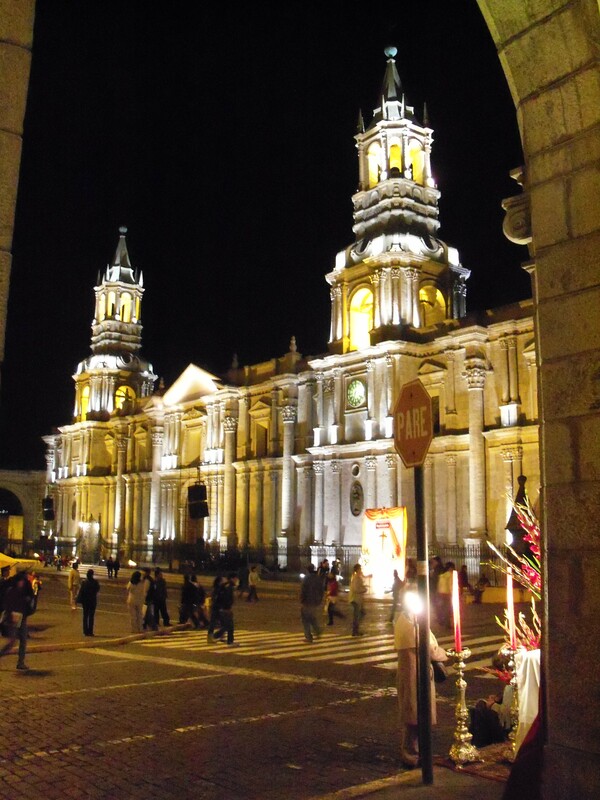 Last night watching the faithful pray at the Stations of the Cross around the perimeter of the Plaza de Armas in Arequipa, we felt that old seductive pull of the choir, candles, incense, and liturgy. The cadence of the liturgy was familiar and swept us into the faith of our fathers even if some of the Spanish was lost in translation. Imagine palm trees, benches, and a fountain in the central plaza. Although Arequipa is at 7,800 feet, it is close enough to the equator to have three harvests every year. On the north quadrant, a white (volcanic ash) two-towered cathedral was lit up like a centenarian’s birthday cake. The 19th century cathedral itself is relatively new. “New” in a town that is a UNESCO World Heritage site based on its numerous 17th and 18th century colonial buildings. Despite frequent earthquakes (the most recent in 2001) many of the buildings have been engineered to withstand the forces of nature. The hollow columns, the height of the church and the low vaulting minimize the impact of earthquakes. Reflect on the part that religion has played in your life. Read Salvation by Langston Hughes. Beginning with the faith of your fathers, reflect on a moment when doubt destroyed your childish notions. We travel with The Ramblers, an U.K. hiking/travel group, and I must apologize to those with whom we travel. I think they are under the impression that I am faithfully recording every stop on the trip – that I’m writing a travel diary of sorts. In reality, I only have time to blog the bits that catch my fancy. And today, as the Peruvians prepare for Palm Sunday, my thoughts turn to religion. You’ll find no thesis here – just a jumble. Reading this blog is sort of like going through that kitchen drawer – the one that has the pliers, twine, screws, nails, Scotch tape, odd buttons, and upholstery thread. Last night, the faithful worked their way around the perimeter of the Plaza de Armas moving from station to station of the cross. It was a moving sight. Pizarro draws a line in the sand. This in contrast to visiting Lima’s cathedral, the third on the site since the first was built in 1555. 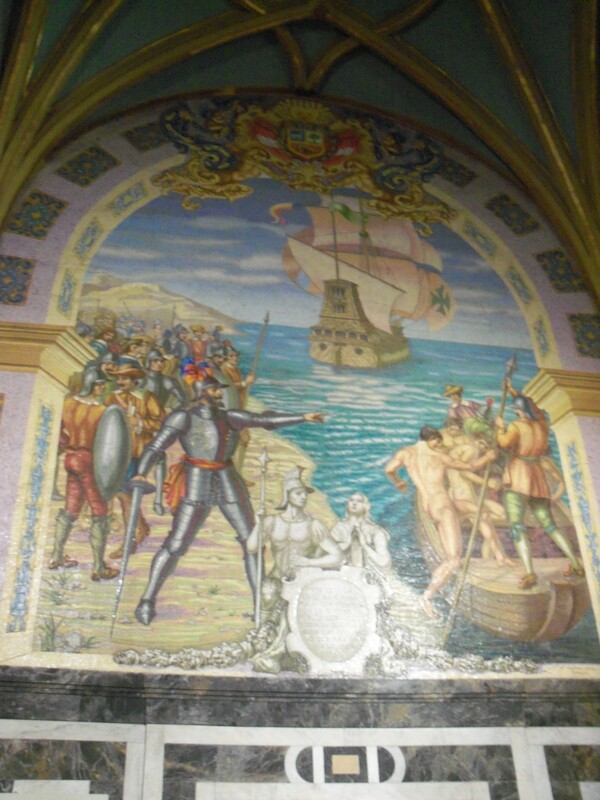 Francisco Pizarro’s remains are here and a large mosaic tells the story. On arrival, Pizarro stepped on firm land, drew a line in the sand and challenged his starving men to cross the line. For those who followed him, gold and glory; for those who stayed behind, lifelong regret. The 13 who crossed the line did indeed become fabulously wealthy. But the conquistadors, driven by gold, silver, religious zeal, and a lust for Empire, drove a hard bargain. In 1572, after years of bloodshed, the Spanish dragged the last Inca king, Tupac Amaru, to Cusco in chains, converted him to Christianity and executed him. Am I alone thinking that this was an un-Christian act? Christianity has a lot to answer for in terms of its forced conversion of native population. The catacombs of the Church of San Francisco (also in Lima) was also interesting in that we passed bin after bin of bones. Not all the bones were binned, just the thigh bones. Walking and ducking through the catacombs, we passed burial pits that were divided into bins. Each bin was full of thigh bones. Upon death, bodies (I would think that would be only ruling class, Spanish bodies) were taken to the catacombs and buried in their entirety in the family bin. Some years later, the corpse was exhumed, and a thigh bone was saved. That thigh bone was then placed in the bottom of the chamber with the ancestors’ thigh bones to make space at the top of the bin for the corpses of the next generation. This practice was followed until the end of the 18th century when cemeteries came into common usage. And finally, we visited the Santa Catalina monastery built in the 1580’s. The monastery was home to the second-born daughters who had been donated to the church by their wealthy Spanish families. The girls entered at 12-years-of-age, and their parents paid 100 silver coins a year for their up-keep. At 16 the girls were given the choice of remaining in the convent or marrying a man chosen by their father. If they chose to remain, their father paid the convent a dowry of 1200 silver coins. Those who stayed behind were allowed to furnish their cells and also take a servant with them. It was a strict order in that the women were cloistered and were only allowed to talk to outsiders through the grill-work. Twice a week they confessed to a priest on the other side of the grill. They spent their days baking bread, cakes, and communion wafers. All in all it wasn’t a good time to be female. The most famous of these nuns was Beata Ana de Los Angelos (1606-1686) who came to the convent at the age of three. At 14 she chose to stay in the convent rather than marry a man selected by her father. The last ten years of her life she was blind and paralyzed. In 1985, Pope John Paul the II beatified Beata Ana. She is in line to sainthood in that when her body was exhumed ten years after her death, it showed no signs of decay. 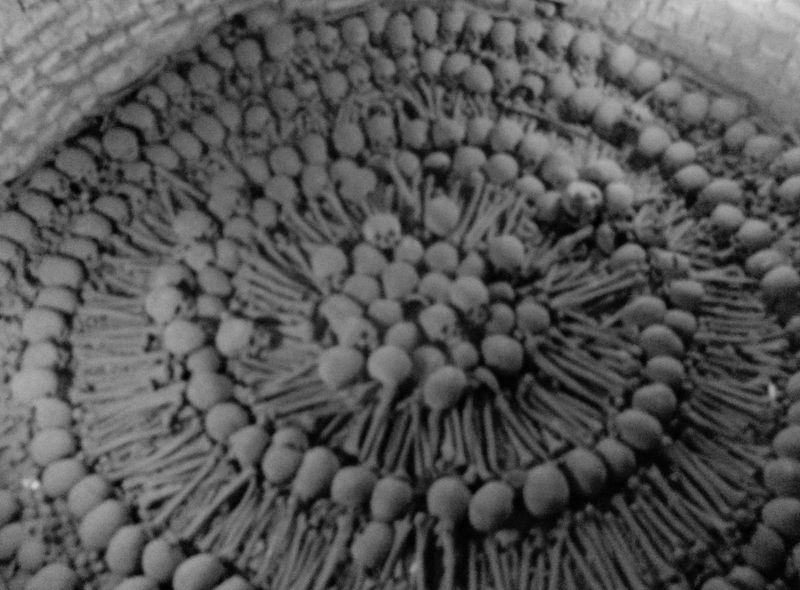 In addition, in 1932, a woman stricken with terminal cancer was cured when she ate soil from Beata Ana’s tomb. Faith is not for the faint-of-heart. Thanks for sharing such well-written details and thoughts on your trip. (Wish we were in Peru!) Much Love to all, Rick & Kim in Wichita, Ks.